"Dium" redirects here. For other uses, see Dium (disambiguation). Dion or Dio (Ancient Greek: Δῖον, Díon; Greek: Δίο, Dío; Latin: Dium) is a village and a former municipality in the Pieria regional unit, Greece. Since the 2011 local government reform, it is part of the municipality Dio-Olympos, of which it is a municipal unit. It is located at the foot of Mount Olympus at a distance of 17 km from the capital city of Katerini. It is best known for its great ancient Macedonian sanctuary of Zeus and city, much of which is visible in the Archaeological Park of Dion and the Archaeological Museum of Dion. Plan of Dion. The sanctuaries and the city (Archive of the excavation of the Aristotle University of Thessaloniki/Drawing of Orkopoulos – Palli 1995) [Pandermalis (1997), p. 14-15]. View of a statue, Sanctuary of Isis. The ancient city owes its name to the most important Macedonian sanctuary dedicated to Zeus (Dios, "of Zeus"), leader of the gods who dwelt on Mount Olympus; as recorded by Hesiod's Catalogue of Women, Thyia, daughter of Deucalion, bore Zeus two sons, Magnes and Makednos, eponyms of Magnetes and Macedonians, who dwelt in Pieria at the foot of Mount Olympus. Hence from very ancient times, a large altar had been set up for the worship of Olympian Zeus and his daughters, the Muses, in a unique environment characterised by rich vegetation, towering trees, countless springs and a navigable river. For this reason Dion was the "sacred place" of the Ancient Macedonians. It was the place where the kings made splendid sacrifices to celebrate the new year of the Macedonian calendar at the end of September. In the Spring, purification rites of the army and victory feasts were held. The first mention of Dion in history comes from Thucydides, who reports that it was the first city reached by the Spartan general Brasidas after crossing from Thessaly into Macedon on his way through the realm of his ally Perdiccas II during his expedition against the Athenian colonies of Thrace in 424 BC. According to Diodorus Siculus, it was Archelaus I who, at the end of the 5th century BC when the Macedonian state acquired great power and emerged onto the stage of history, gave the city and its sanctuary their subsequent importance by instituting a nine-day festival of games that included athletic and dramatic competitions in honor of Zeus and the Muses, whose organisation was overseen by the Macedonian kings themselves. Many ancient authors speak of the sculptural bronze masterpiece by Lysippos made for Alexander depicting 25 mounted companions who fell at the Battle of the Granicus and later taken to Rome by Metellus. A city was built adjacent to the sacred sites that acquired monumental form during the reigns of Alexander the Great's successors and Cassander took a great interest in the city erecting strong walls and public buildings, so that in Hellenistic times Dion was renowned far and wide for its fortification and splendid monuments. Dion and its sanctuary was destroyed during the Social War in 219 BC by Aetolian invaders but was immediately rebuilt by Philip V. Many of the dedications from the sanctuary that had been destroyed were buried in pits, including royal inscriptions and treaties, and these have been discovered recently. It fell to the Romans in 169 BC and the city was given a new lease of life in 32/31 BC when Octavian founded the Colony of COLONIA JULIA AUGUSTA DIENSIS here. Coins of colonial Dion survive. It experienced its second heyday during the reigns of 2nd- and 3rd-century AD Roman emperors who were fond of Alexander the Great. Dion's final important period was in the 4th and 5th centuries AD when it became the seat of a bishopric. It was abandoned following major earthquakes and floods. The modern village at the site was called Malathria until 1961, when it was renamed to Dio. The site of ancient Dion was first identified by the English traveler William Martin Leake on December 2, 1806, in the ruins adjoining the village of Malathria. He published his discovery in the third volume of his Travels in Northern Greece in 1835. Léon Heuzey visited the site during his famous Macedonian archaeological mission of 1855 and again in 1861 when he also detected the ancient Leivithra. Later, the epigraphist G. Oikonomos published the first series of inscriptions. Nevertheless, systematic archaeological exploration did not begin until 1928. From then until 1931, G. Sotiriadis carried out a series of surveys, uncovering a 4th-century BC Macedonian tomb and an early Christian basilica. Excavations were not resumed until 1960 under the direction of G. Bakalakis in the area of the theatre and the wall. Since 1973, Professor D. Pandermalis of the Aristotle University of Thessaloniki has conducted archaeological research in the city. A rare and unusual find in the museum is a bronze "hydraulis" or hydraulic musical pipe organ found in a former workshop. In 2006, a statue of Hera was found built into the walls of the city. The statue, 2200 years old, had been used by the early Christians of Dion as filling for the city's defensive wall. In October 1992, the municipality Dio (Dimos Diou) was formed. 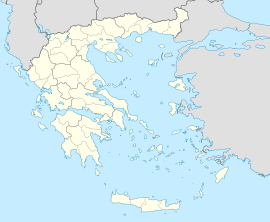 At the 1997 Kapodistrias reform, it was expanded with the former communities Agios Spyridonas, Karitsa, Kondariotissa, Nea Efesos and Vrontou. The administrative center was in the village of Kondariotissa. At the 2011 local government reform Dio merged with the former municipalities East Olympos and Litochoro to form the new municipality Dio-Olympos. Dio became a municipal unit of the newly formed municipality, and the former municipal districts became communities. The community of Dion consists of the village of the same name and Platanakia. The municipal unit has an area of 172.743 km2, the community 31.375 km2. ^ Hesiod, Catalogue of Women fr. 7. ^ Thucydides. History of the Peloponnesian War. 4.78. ^ Livy. Ab Urbe Condita Libri (History of Rome). 44.7. ^ Pliny. Naturalis Historia. 4.10. ^ Ptolemy. The Geography. 3.13.15. ^ Smith, William, ed. (1854–1857). "Dium". Dictionary of Greek and Roman Geography. London: John Murray. ^ Kantouris, Costas. Greek archaeologists find Hera statue. Associated Press. March 1, 2007. F. Papazoglou, Les villes de Macédoine romaine, Supplément 18 du BCH, Paris, 1988. D. Pandermalis, Dion, the archaeological site and the museum, Athens, 1997. Wikimedia Commons has media related to Dion (Greece). This page was last edited on 11 March 2019, at 11:57 (UTC).